A curator is a person who manages, administers, or organizes a collection for exhibition—at a museum, library, archive, zoo, and others. The term originates from the from the Latin (cura), which means "care." 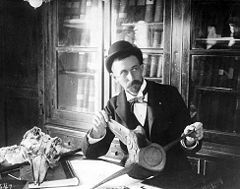 A curator is a content specialist responsible for an institution's collections and, together with a publications specialist, their associated collections catalog. Area specialist curators research the background of the collection, interpret the meaning and value of each item, and provide expert knowledge. As institutions encounter a number of challenges and opportunities, curators must also exercise their creativity. Cultural heritage institutions provide unique educational environments where people can learn about other diverse cultural traditions as well as their own cultural heritage in historical and global contexts. Curators have the unique role of building a culture of peace by enhancing mutual respect and understanding among people in different cultural traditions. Curators at zoos, aquariums, and botanical gardens also provide opportunities to understand the value and mechanisms of nature. In smaller organizations, a curator may have sole responsibility for the acquisition and care of objects. The curator will make decisions regarding what objects to collect, oversee their care and documentation, conduct research based on the collection, provide proper packaging of art for transport, and share that research with the public and scholarly community through exhibitions and publications. In very small volunteer-based museums, such as local historical societies, a curator may be the only paid staff member. In larger institutions, the curator's primary function is as a subject specialist, with the expectation that he or she will conduct original research on objects and guide the organization in its collecting. Such institutions can have multiple curators, each assigned to a specific collecting area (for example, Curator of Ancient Art, Curator of Prints and Drawings, and so on) and often operating under the direction of a head curator. In such organizations, the physical care of the collection may be overseen by museum collections managers or museum conservators, and documentation and administrative matters (such as insurance and loans) are handled by a museum registrar. In contemporary art, the title curator is given to a person who organizes an exhibition. In this context, to curate means to select works of art and arrange them to achieve a desired effect. This might involve finding a strategy for display. Thematic, conceptual, and formal approaches are all prevalent. In addition to selecting works, the curator often is responsible for writing labels, catalog essays, and other supporting content for the exhibition. Such curators may be permanent staff members, be "guest curators" from an affiliated organization or university, or be "freelance curators" working on a consultant basis. The late twentieth century saw an explosion of artists organizing exhibitions. The artist-curator has a long tradition of influence. Notable among these was Sir Joshua Reynolds, founder of the Royal Academy, London. In the United Kingdom, the term curator is also applied to government employees who monitor the quality of contract archaeological work under PPG 16 and are considered to manage the cultural resource of a region. In the museum setting, a curator in the United Kingdom may also be called a "keeper." In some American organizations, the term curator is also used to designate the head of any given division of a cultural organization. This has led to the proliferation of titles such as "Curator of Education" and "Curator of Exhibitions." This trend has increasingly been mirrored in the United Kingdom in such institutions as Ikon, Birmingham, and Baltic, Gateshead. In Australia and New Zealand, the person who prepares a sports ground for use (especially a cricket ground) is known as a curator. This job is equivalent to that of groundsman in some other cricketing nations. Traditionally, curators have held an advanced academic degree in their subject. For larger organizations, this is typically a Doctor of Philosophy. In smaller institutions, a Master's degree is sometimes acceptable. Along with an advanced degree, curators are expected to have contributed to their academic field by publishing articles and presenting at conferences. In addition, curators need to have knowledge of the current collecting market for their area of expertise, and be aware of current ethical practices and laws that may impact their organization's collecting. Recently, the increased complexity of many museums and cultural organizations and the corresponding emergence of professional programs in field such as Museum Studies, Arts Administration, and Public History, have encouraged the development of curators with training in non-academic areas such as non-profit administration, fundraising, and public education. Today, as art institutions face an array of new challenges, the role of the curator is being re-thought. One consequence of this has been the emergence of academic courses in contemporary art and curatorial practice (for example, at the Kingston University, UK, Goldsmiths College, UK, Royal College of Art, UK, University of Sunderland, UK, California College of the Arts, U.S., Bard College, U.S., Université de Rennes II, France, and so on). Since curator eduction overlaps with librarian and archivist training, many schools require curators to take basic library science courses. The programs often require practical training in the specific field for each student. Curators often hold additional advanced degrees in the area of his or her specialty. Master of Museum Studies at University of Toronto is as follows. The Ocean Voyager exhibit tunnel at the Georgia Aquarium, located in Atlanta, Georgia, U.S. Developments in information science, information technology, the Internet, and architectural and other technologies have created new challenges and opportunities for museums and other cultural heritage institutions; these changes have expanded the responsibilities and roles of curators. First, curators now work in a collaborative work environment, particularly with IT professionals. While the primary roles of curators remain the same, which includes administration, research, and collection managements, curators are required to be familiar with the rapidly changing information environment. Second, digitized materials often require different legal arrangements. Curators must be aware of and sensitive to the legal and ethical aspects of digital exhibitions. Third, visitors not only physically visit the facility, but users from around the world can access an exhibit via the Internet. Thus, even the smallest institutions can have a global audience, which requires services that fulfill the needs of a global audience, such as descriptions in multiple languages. Fourth, new technologies allow curators to exercise their creativity in ways that were never before possible. 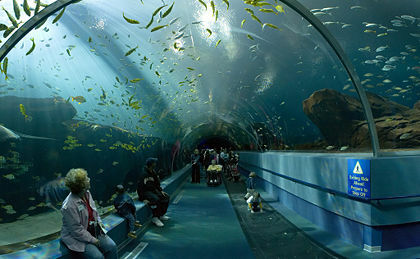 Some aquariums, for example, have constructed a dome style exhibit where visitors can view fish and other sea creatures from underneath. Finally, curators need to have more entrepreneurial skills. While the availability of public and private funds decrease, cultural heritage institutions are gradually adopting the principles of a free market economy. The attractiveness of an institution is determined not only by its collections, but also by the services it provides. Some institutions, for example, develop and offer teaching materials as resources for teachers, who then integrate field trips with classroom instruction using those teaching materials. Some archives offer digitized primary documents linked with teaching materials. ↑ Master of Museum Studies, University of Toronto. Retrieved July 31, 2008. ↑ Stephen Bury, 21st Century Curatorship (New York: New York Public Library, 2004). Burcaw, G. 1997. Introduction to Museum Work, 3rd edition. Lanham, MD: Altamira Press. ISBN 978-0-761-98926-4. Glaser, J., and A. Zenetou. 1996. Museums: A Place to Work. Routledge. ISBN 978-0-415-12724-0. Lord, G., and B. Lord. 1997. The Manual of Museum Management. Lanham, MD: Altamira Press. ISBN 0-7591-0249-X. Rugg, J., and M. Segdwick. 2007. Issues in Curating. Intellect. ISBN 978-1-84150-162-8. This page was last modified on 22 November 2017, at 21:39.